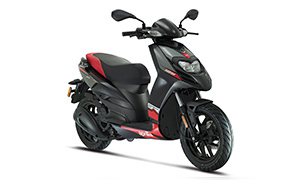 The Aprilia brand was acquired by the Piaggio Group in 2004 and immediately M. Demajo & Co Ltd started to introduce and import these scooters along with super bikes like the RSV4R and other Aprilia models. Today, Aprilia scooters and motorcycles are one of the most popular for their sporty looks and fantastic designs in the local 2 wheeler sector. Aprilia started as a scooter manufacturer, but has more recently come to be known for its race-winning sportbikes. 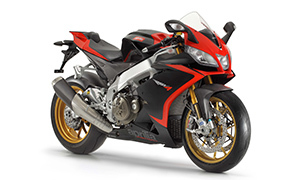 It is also known for its flagship 1,000 cc V-twin Superbike, the RSV Mille and latest V4-based RSV4. Founded after the Second World War by Cavaliere Alberto Beggio, as a bicycle production factory at Noale, Italy in the province of Venice. The first production Aprilia mopeds were named Colibrì, Daniela and Packi. Aprilia later produced a motocross bike in 1970 called the Scarabeo. Produced until the end of the 1970s, In 1977 Ivan Alborghetti from Milan, Italy won the Italian 125 and 250 cc motorcross championships on Aprilias. In 1990 Aprilia launched the Pegaso 600, a road bike derived from off-road mechanics. Later, in 1992 Aprilia rider Alessandro Gramigni won the World 125 Road Racing Championship title. Also in 1992, Tommy Ahvala won the World Trials Championship on an Aprilia Climber. Since then, Aprilia has 124 times won 125 and 250 cc class Grand Prix, 15 Road Racing World Championship titles, and 16 European speed titles. Many world champions started on Aprilia such as Biaggi, Capirossi, Gramigni, Locatelli, Sakata and Rossi. Also in the 1990s, Aprilia entered the scooter market starting in 1990 with Italy’s first all-plastic scooter, the Amico. In 1992, Aprilia introduced the Amico LK and the twin cylinder Pegaso 125, both with catalytic converters. In 1993 Aprilia launched a large diameter wheel scooter reusing the name Scarabeo with a four-stroke, four-valve engine. Later Aprilia launched more scooters such as the Leonardo, the SR and the Gulliver. In 1999 Aprilia entered World Superbike Championship racing with its RSV Mille, and during 2000, Aprilia acquired Moto-Guzzi and Laverda, both historic heritage Italian marques. Most recently, in 2003, Aprilia launched the RSV Mille Tuono which was essentially an RSV Mille with motorcross-style high handlebars and only a small headlight fairing. Most of the major motorcycle magazines picked it for the best bike of the year. In 2004 Aprilia was acquired by Piaggio & C. SpA, to form the world’s fourth largest motorcycle group with 1.5 billion Euro in sales, an annual production capacity of over 600,000 vehicles, and a presence in 50 countries. On 15 August 2010, Aprilia became the most successful motorcycle racing brand in history, surpassing fellow Italian MV Agusta with a record 276th victory. Sed vel dolor non orci eleifend viverra. Nullam porta porta lorem, ac tempor tellus scelerisque id. Donec sollicitudin lacus augue. Vivamus nunc lorem, sagittis ac mollis ut, bibendum non massa. Aliquam vestibulum adipiscing erat, at adipiscing ligula consectetur eu. Turpis cursus lobortis. Donec lorem nunc, ultrices id interdum ac, pellentesque ac nulla. Sed malesuada rhoncus neque nec blandit. Aliquam eleifend tortor convallis magna posuere at tristique est porttitor. Donec elementum vulputate arcu, sed tristique neque egestas et.